EUR/USD sold off for the third consecutive trading day but buyers are swooping in above 1.1720. This level is significant because it is where the 200-week SMA converges with the 23.6% Fibonacci retracement of the 2008 to 2016 sell-off as well as the 38.2% Fib retracement of the 2014 to 2016 decline. The point is that this is a very important support level and the prime place for EUR/USD to bounce. On a fundamental basis, the outlook for the Eurozone economy is positive and should only be a matter of time before Germany announces a coalition government. With the Federal Reserve meeting and Trump’s tax speech behind us, investors will be able to shift their focus to the European Central Bank who have made it very clear that balance sheet changes are coming next month. 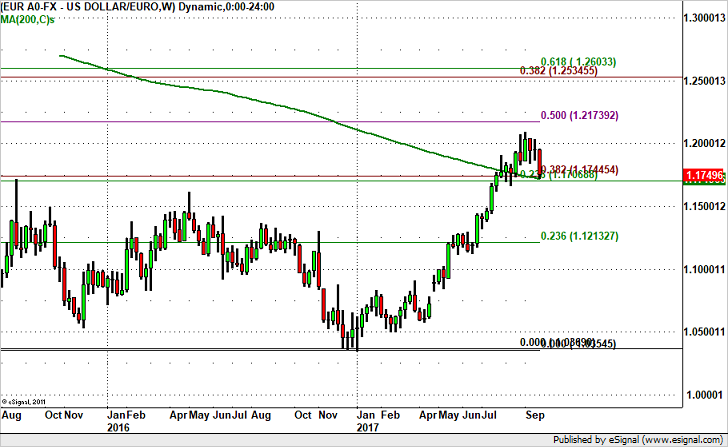 For this reason, we like buying euros and believe that the EUR/USD will find its way back above 1.18. German consumer prices and Eurozone confidence numbers are scheduled for release on Thursday. Improvements are expected in both reports.